Greetings! This is Steve from MOONEYES, MOON Space Agency (MSA). A historic event took place in Indonesia recently. As we have noticed, the Kustom Kulture scene is world wide. In June this year, I was lucky enough to attend a Kustom Kulture event in Kuala Lumpur, Malaysia. This time around, MOONEYES went to Jogjakarta, Indonesia (view photos) for the first ever Kustom Kulture event in Indonesia called KustomFest 2012! An amazing two-day event at the Jogja Expo Center (JEC) with so many things to see! For several years, a talented custom motorcycle builder from Indonesia has made his presence known especially in Japan. Retro Classic Cycles owner, Lulut Wahjudi, also known as LT and nicknamed Yaku in Japan has shown his creations at several shows in Japan including the Yokohama Hot Rod Custom Show. In recent years he has hosted motorcycle shows in his native country of Indonesia. Knowing that there is a large Kustom Kulture scene, he decided to put together this historic event. Not only was the indoor event hall filled with cars and motorcycles, there were also sections for bicycles, pedal cars and skateboarding. Along the perimeter were vendor booths as well as kustom painters and tattoo artists. The event flowed outdoors too with swap meet style vendors, custom painting contest, BMX ramps and a stage for live bands. View photos here & here. The event lasted two days, from October 6-7 and ran until 10PM each night. One unique feature about the event was that each entry had to pass "scrutineering (view gallery)" in order to get their space. This included a running engine, a steady idle for one minute, a clutch and in-gear test, a brake test and finally a test run around a large circle of cones. The number of bikes made the testing literally last until the next morning. When I arrived at the event area it was already dark and they were busy checking each bike. LT stayed up for two days checking each entry. 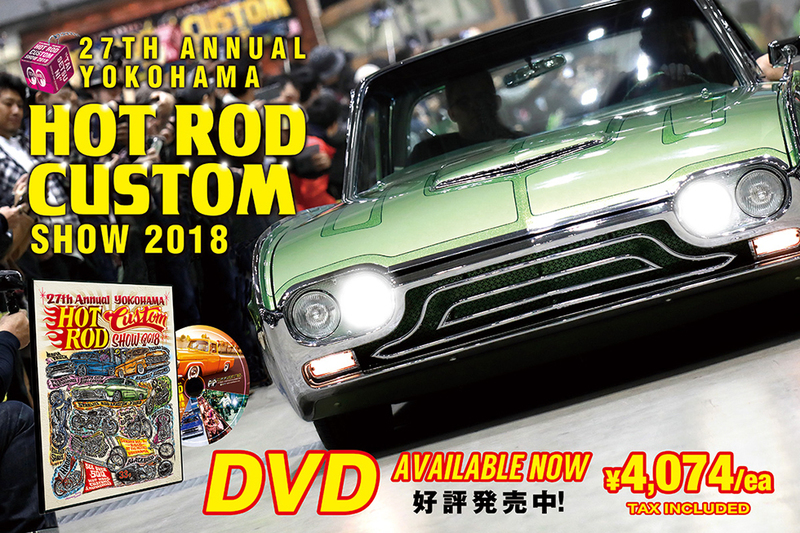 We had the honor of presenting a MOONEYES Pick award at this event. Wildman did his magic and created an awesome MOON Disc award. It was difficult to choose one winner as you could tell that hours upon hours of hard work was put into each build. Based on what I saw at this event, the custom scene is thriving. It truly shows that just about anything can be customized. In the end, the MOONEYES Pick went to a red '32 Ford 5-window Coupe build by Hot Rod Indonesia. Congratulations! There were many live bands that played on the stage inside as well as the outdoor stage. From Rockabilly to Death Metal! There was a bike stunt demonstration, skateboard competition, BMX competition, art exhibition, custom paint contest and more. Vendors (view photos) from not only Indonesia but Malaysia and beyond were at this event. I got to meet up with friends I met in Malaysia too. The support from everyone that loves the custom scene is very strong. People will travel to show their support and love of Kustom Kulture. The grand finale was the door prize. Retro Classic Cycles build a custom Triumph chopper as a give-away door prize. Hundreds of people gathered at the outdoor stage for this final moment. In the end, a local taxi driver that bought eight tickets won the bike and he was a extremely happy! I was asked many times about how the Indonesia custom scene measures up to the Japanese custom scene. My thought is that they are completely different. Not in quality and craftsmanship, but the underlining cultures make them different. As for quality and craftsmanship, you can tell they each have what it takes to make superb custom machines what ever it may be. This is an event to see firsthand with your own eyes. The event hall has already been reserved for next year. My recommendation is that you make plans to attend these events in Asia. There is a lot to see and appreciate out there. Just be sure to reserve the first week of October for KustomFest 2013! Thank you for reading my Indonesia Trip Report. I hope this will stir your interest in events abroad and hope to return again next year for the event myself. Be sure to stay extra days too as there are many sites to see and do there. Hope to see you at the show!